We will be having a drift session in SIC PA1 parking on the 3rd December 2011. All are welcome as we will be having two drifting surfaces: Wet for those who want to have fun and Dry for those who want to set up their cars and practice for the up coming Formula Drift Malaysia. We will be limiting the participants to only 40 drifters , so please contact Jane at 012 4870487 to reserve a spot!! This entry was posted in Posting by Ariff, Sync Optima Events on November 25, 2011 by skagee. We took over 132 passengers on our drift experience taxi ride in Sepang last weekend. Here’s a blury video of that event. We will be organising a drift session in Sepang on the 3rd of December 2011. All drifters are welcome to drift on this wet , fun course! Please contact us for more details!!! 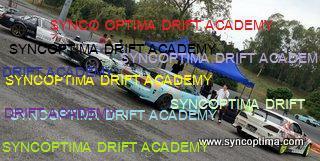 This entry was posted in Drifting, Posting by Ariff, Sync Optima Events on November 22, 2011 by skagee. It was a tall order for to retain the Championship Title I held for this year. I was currently running 5th and I had to win this round while the other top 3 drifters had to not go past top 16 inorder for me to win for this year. I actually knew since round 2 that I had to forgo this year’s titles fight but I really wanted to win , at least podium for this final round! The first day of practice went great. SLOW handled like a dream with the subtle setup changes I’ve made. Jane performed equally as well as she is getting more and more confident with her car . It was towards the end of the session I was struggling to lock up the rear wheel with the handbrake but it wasn’t a major cause of concern as Kian and Boy are scheduled to arrive the next day and it would be a simple fix..so I thought. We arrived at the track bright and early.Kian and boy were already there and soon set off fixing the frail handbrake. Apparently the problem was a lot more serious as one of the pistons on the caliper had somehow corroded and had badly damaged the lining of the caliper cylinder causing it to stick.Kian tried his best fixing it and told me to go out for practice and hope it would loosen .It didnt. To make matter worse I broke the drive shaft on my 6th practice lap.So it was a a mad rush to get the replacement shaft and some how Kian and boy managed to get the car up and running for the last official practice where I only managed 5 consecutive unsuccessful runs before it was time to qualify!! I opt to run first and somehow managed a 3rd overall with Jane bagging 9th!!! From there onwards things got worse as I managed to go through best 16 cleanly without and need of the handbrake. but when my opponent slowerd down considerably at the top 8 battle it had me plowing towards him , ending my campaign for the day. Luck also had it that Jane broke her gearbox on her very first tandem run! !Oh well . This event also marks the end of our contract with Goodyear. Due to the economical climate, the new management team felt that it wasn’t viable to keep us on board .This is understandably so, however ,after being in the team for 2 years ,it would had been nice if the news of us being dropped were conveyed in other ways but I guess a single sentence on a email would suffice. LOL. Anyway it has been a wonderful 2 year working relationship that we had and we are proud to say we were able to build the team to be come the number 1 drift team in Malaysia! Stay tune for updates on our new sponsors!! This entry was posted in Drifting on November 21, 2011 by skagee.